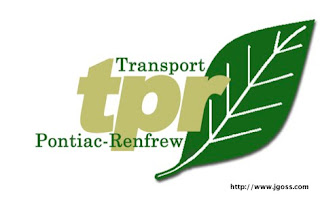 (Campbell’s Bay, QC, April 23, 2012) The not-for-profit Transport Pontiac-Renfrew (TPR) has provided a progress report including information on a new Board structure and final timelines for the pending acquisition of the CN Beachburg Subdivision railway line. In an April 19th briefing session for elected officials and representatives from the municipalities through which the line runs, existing TPR executives presented a well structured overview of its developing plan. Also included in the briefing, information on a new set of By-Laws to ensure TPR, as a not-for-profit entity, is governed by and for the people of these communities. “The bylaws create a new membership which in turn will elect a new Board of Directors,” says TPR Board member Lubomyr Chabursky. “The membership is divided into four groups to ensure that each constituency has a strong and balanced voice in the governance of TPR.” The groups will include municipalities; community organizations and economic development organizations; industrial users; and interests of passenger users (for future commuter initiatives). The fledgling railway operation itself will be managed as a for-profit activity reporting directly to TPR. Net profits from the operation will return to TPR for its use within the specific municipalities / communities. The railway operation will be headed by former Ottawa Central Railway general manager, James Allen. The plan to acquire the rail line has been developing since 2009 when CN placed the line on its abandonment list. Business and industry in MRC Pontiac and Renfrew County have stated that in today’s post-2008 recession economy, rail is needed as a shipping option. Overall, rail access itself presents a key tool to the economic rejuvenation of the region. The briefing was held at the closed ATC Panels facility in Pembroke. Representing only one example, the plant will be in a better position to reopen, ramp-up and re-hire if rail remains. Rail is both cost-effective and environmentally preferable especially for long-haul shipments. From west to east, municipalities along the corridor include the City of Pembroke, Laurentian Hills and Whitewater before it crosses into Québec at Portage-du-Fort. Clarendon, Litchfield, Pontiac, and Bristol are affected in Québec ahead of the line’s return to Ontario and the City of Ottawa at Fitzroy Harbour. The line continues east to Walkley Yard in Ottawa.